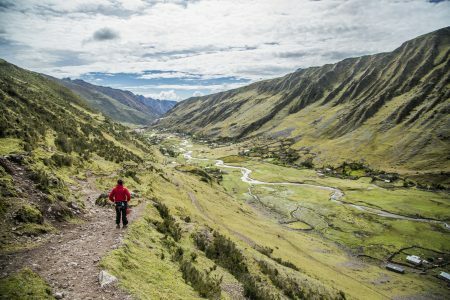 The Sacred Valley & Lares Adventure to Machu Picchu offers the perfect combination of adventure travel and cultural immersion. 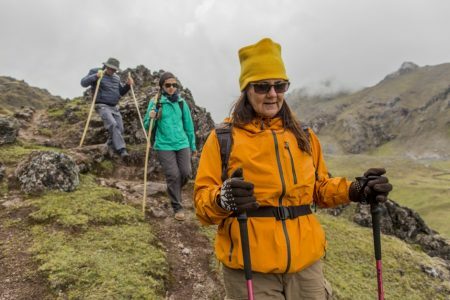 Your experience on our 5 or 7 day lodge-to-lodge journey will alternate between an exploration of the astounding natural scenery of the Sacred Valley of the Incas and an intimate look at Andean culture, both in busy towns and in the most-remote of mountain hamlets. 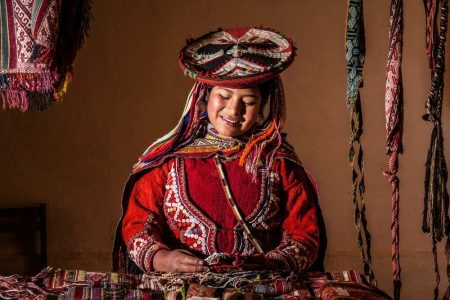 – Cultural activity: Visit Awanakancha (an Andean camelid exhibition and traditional textile center), the town of Pisaq and local market, and experience an encounter with members of the local community of Viacha. – Hike: From the local community of Amaru to the local community of Viacha / Duration 2.5-3 hrs. / Moderate / Mountain pass at an elevation of 14,200´ – 4,328m. Group Activity: Group lunch at the local community of Viacha. In the afternoon, the whole group visits the Pisaq archeological site together, before heading to the lodge. 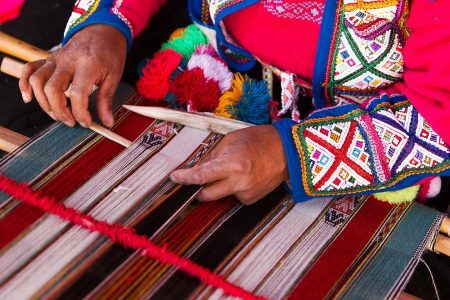 – Cultural activity: Visit the town of Choquecancha, meet with local weavers and visit the old church. – Hike: From Quelquena to Huacahuasi / Duration 2-2.5 hrs. / Easy to moderate / Mountain pass at an elevation of 12,595´- 3,839 m.
– Hike: From Cuncani to Huacahuasi / Duration 3.5-4 hrs. / Moderate / Mountain pass at an elevation of 13,838´- 4,219m. River countryside on your way to Ollantaytambo, where you can spend time meandering through its charming maze-like streets. – Cultural activity: Drive back to the Sacred Valley of the Incas, visit a local farmer’s market and a Pre- Inca and Inca cultural museum. 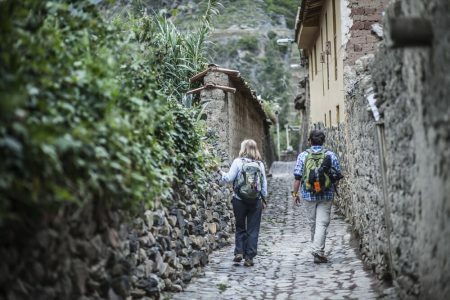 Enjoy a Barbeque lunch at a Kuychi Rumi and in the afternoon explore the town of Ollantaytambo. – Inca Trail hike: Beautiful hike from Lares pass to the village of Totora / Duration 3 hrs. / Easy to moderate. Enjoy a Barbeque lunch at a Kuychi Rumi. – Hike: From Huacahuasi to Patacancha / Duration 7 hrs. / Moderate to challenging / Mountain pass at an elevation of 14,646’ – 4,464m. Route lunch at Ipsaycocha lake. Afternoon arrival in Ollantaytambo. – Optional bike excursion (afternoon): Drive back and explore the Sacred Valley of the Incas on mountain bike from Urubamba to Pachar / Duration 2 hrs./ Easy to moderate. (this activity has an additional cost). Afterwards, enjoy a visit to an artisanal brewery in which many of their beers are made with local products. (the brewery is closed Mondays and Tuesdays). 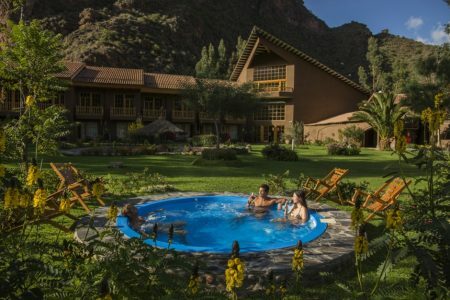 Overnight: Hotel in the Sacred Valley of the Incas (el. 9,284’ – 2,830m.). ride along the famous Urubamba River to Aguas Calientes, the town below Machu Picchu, whose charm lies in a history that began as a small railway stop and evolved into a bustling town still bisected by the train tracks. 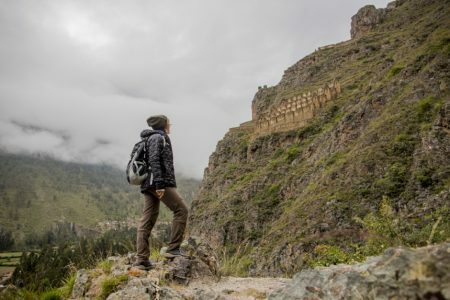 – Hike: Lower Pinkuylluna mountain above Ollantaytambo / Duration 1-1.5 hrs. / Moderate. – Hike: Higher Pinkuylluna mountain above Ollantaytambo / Duration 2-2.5 hrs. / Moderate to challenging. Note: Inca Rail is the train company used for the Lares Adventure. If a special train service is required, please advise your Travel Specialist. 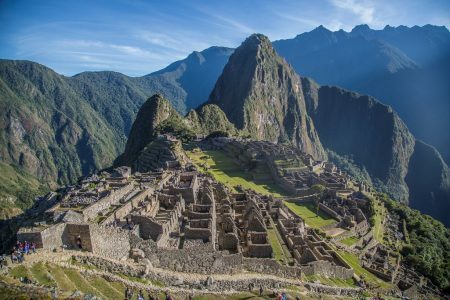 – Cultural activity: Free time to explore the Inca citadel of Machu Picchu (el. 7,872´ – 2,400m.). OR Hike: Guided hike of Huayna Picchu mountain / Duration 2-2.5 hrs. / Moderate to challenging / Mountain pass at an elevation of 8,924´ – 2,720m. Note: Huayna Picchu mountain tickets are subject to availability. Inca Rail is the train company used for the Lares Adventure. If a special train service is required, please advise your Travel Specialist.